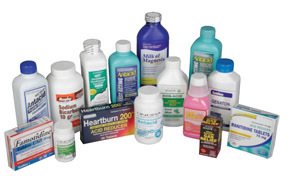 If you’re thinking of using medicines to treat heartburn, here are the 3 options. Antacids such as Mylanta, Eno, Quick Eze and Gaviscon help neutralise stomach acids. They offer quick relief but fail to heal existing oesophageal damage or prevent heartburn from happening again. Their effects don’t last more than an hour. H2-receptor blockers such as ranitidine and cimetidine reduce the production of stomach acid. They work slower than antacids but you can enjoy more lasting relief from the discomfort of acid reflux. These medicines allow the oesophagus to heal and relieves the symptoms completely. Proton-pump inhibitors such as omeprazole and lansoprazole suppress block stomach acid production and heal the damaged oesophagus. They are available on prescription only. Next > Instant Heartburn Relief: Which One Can Deliver Quick Results? Any Cheaper Alternative To Heartburn Prescription Drug? Instant Heartburn Relief: Which One Can Deliver Quick Results? I am a busy guy, working in a farm. When I am not taking care of my dog, I take time to share effective remedies for heartburn on my blog. I find the time to cook at home with my own recipes as it has transformed my life and improved my digestion.